This is a step-by-step tutorial for DIY hand painted Easter eggs! Easter is coming up soon and that means decorating. I visited Prague and Budapest a few years back during the Easter season and I had never seen such beautiful decorations. There were enormous painted eggs throughout the cites. And colors were bold and saturated. 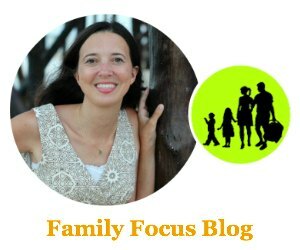 So today I present you with this tutorial so you too can enjoy the beauty of their Easter traditions! I hope you enjoy. You can use real hollowed out eggs for this project but I personally prefer using wooden eggs from a craft store. The wooden ones have a flat base so that they make wooden painted easter eggs that may stand on their own. Next, paint a couple layers as a base on each egg. You can stick with pastel colors, which are typically traditional in the United States. Or, my personal favorite, use a bold color as a base, which is more typically found in places like Prague and Budapest. Now it is time to bring out the smaller detailing brushes and stencils! Create any type of pattern you want. 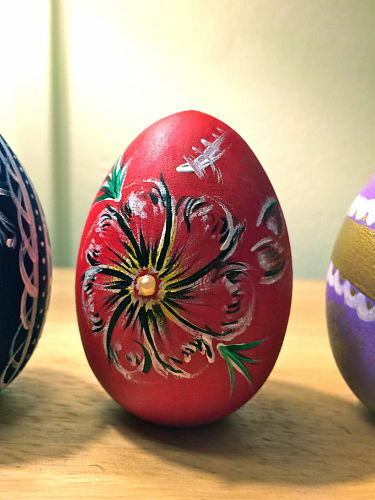 Some good references for painted easter egg ideas would be floral patterns and henna designs. If your eggs need more add some rhinestones. I used small flat-back pearls. You could also use glitter or gold leaf! Now if you want to add more 3D detail in your painted easter egg designs, I would suggest using cerne relief. It dries transparent so you could add it to the base or just use for detail. It is a very unique product. If you are using hollow eggs you can place them in a basket or small glass container or you could hand them on strings! If you are using the flat-based wooden eggs you can decorate all of your shelves and tables with them. Enjoy! 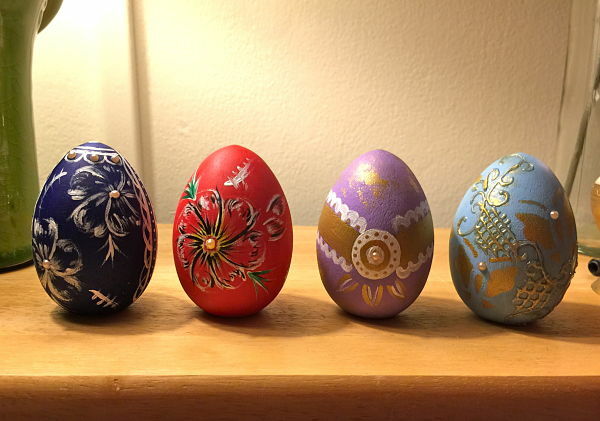 You may also enjoy making embroidery thread Easter eggs! Wow!! 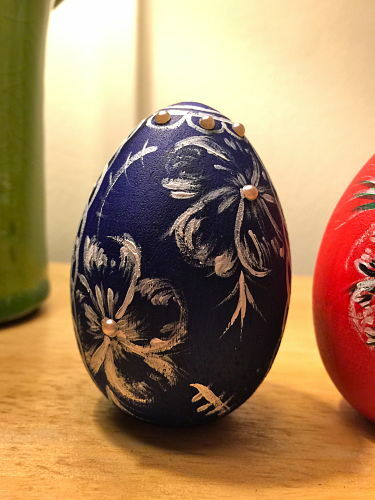 These painted eggs are so beautiful. They’re like little works of art. Thanks for sharing your photos. Wow, great work. 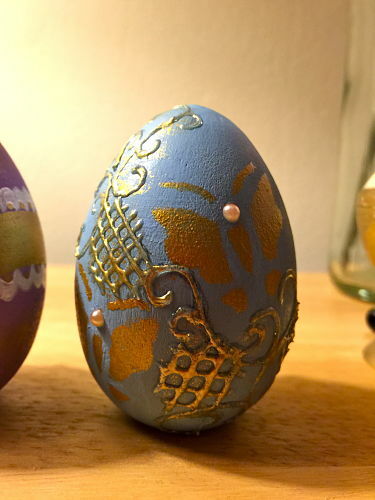 I saw a lot of diy easter eggs and yours are definitely the most beautiful.